The Palestinian Authority, pledged to halt terror, chooses the mother of terrorist murderers to hand over to the United Nations a letter asking for unilateral recognition by the international community. Hmeid's sons were convicted of killing seven Israeli civilians and attempting to murder 12 others. One of her sons, Abd Al-Mun'im Abu Hmeid, was termed by the Palestinian Authority a "martyr." Palestinian Media Watch reported last year that PA Minister of Prisoners' Affairs Issa Karake, had awarded her "the Plaque of Resoluteness and Giving," inscribed with the names of her four sons who are imprisoned. Karake explained she was honored because "it is she who gave birth to the fighters, and she deserves that we bow to her in salute and in honor." 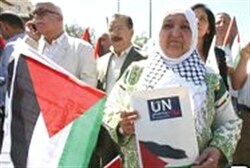 The launching of the campaign by the terrorists' mother was widely reported in Palestinian Authority media, which told readers and television viewers, "We of the 'Palestine - the 194th state' national campaign [calling for] a Palestinian state with full sovereignty on the territory of Palestine, send a delegation from institutions, organizations, and popular factions." "This delegation was headed by Um Nasser Abu Hmeid - this fighter woman, who is the mother of seven prisoners and the mother of the heroic Shahid (Martyr) from the [military wing of Hamas] Izz A-Din Al-Qassam Brigades. This campaign included a letter in which the people demand that the UN recognize Palestine as a state with full sovereignty, like the other countries."